I’ve been thinking a lot about time lately. Time bothers me. It should bother more of us, but most of don’t think that much about it. This year is a leap year (Feb 29th) and will also have a leap second (June 30). The last leap second was in 2008. Exacerbating my feelings, last weekend was Day Light Savings – ugggh. I wasn’t going to blog about time – this being a telecom blog and all – until I saw Dean Bubley’s post The concept of the “minute” is killing the phone industry. His post talks about the carriers age-old practice of equating minutes to dollars. It forces companies to chase after unprofitable or unattractive segments. It leads to arbitrary pricing by vendors. Roaming models look stupid & anachronistic because they are time-based. Our need for a uniform measurement unit creates stifling regulatory hoops & weird market inefficiences. It legitimises the equally absurd measurement of data “consumption” in terms of megabytes. Enterprise equipment vendors don’t get caught up in this – and increasingly neither do the hosted voice providers. Counting minutes requires a considerable amount of overhead, and of course their goal is to encourage their customers to use the technology – talk more, IM more, video more…. collaborate more – be more productive – innovate more. But since Dean brings it up… time is really silly. First off, it is completely man-made and arbitrary. When I say that sometimes people insist it’s natural – that the world has 24 hours in a day and 60 minutes in an hour and 60 seconds in a minute – it’s a natural phenomena. But none of that is true. Yes, it does take a certain amount of time for the Earth to rotate and 365 times longer to revolve around the sun – but man segmented those periods into days, hours, minutes, and seconds. We could have divided the time into tens (metric) and had 10 longer hours in a day. We could have had one time zone and different regional business hours. The great benefit of time is the ability to collaborate with precision. Such as let’s meet at 3. Meetings used to take months to set-up – now we just email a calendar invite which even automatically adjusts for time zones (don’t get me going on time zones). Our current notion of time is actually quite modern – it was agreed and formalized in 1884 at the Meridian Conference. It was here that GMT was agreed and time zones were conceptually defined. the first mechanical clock of sufficient precision to determine a ship’s longitude, based on the difference in the displayed time and the observed “local noon” time. It was largely the work of a single person, English carpenter and self-taught clockmaker John Harrison (1693–1776). The basic idea of time zones was to create approximate zones for high noon. Noon is a silly time to base time. There were other notions – like sunrise as the start of the day (work hours could start an hour after sunrise). That may have been the result if time was defined a hundred years earlier, but we were in the industrial age – who cares when roosters crow – it’s lunch time that matters. DST didn’t come around til 1918 (Willett). It was meant to offset the silliness of creating a day centered around noon. Tracking time has come a long way. For years it was done with a pendulum. 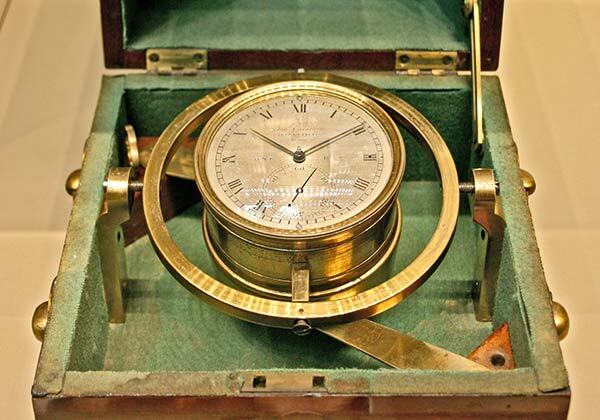 Time keeping was critical to navigation and pendulums didn’t work well at sea. The mechanical clock was a major breakthrough for man on land and sea. Timekeeping became more accurate over the past 50 years. Today, the official time of the US is kept by several atomic clocks in Boulder, CO. They actually average them to figure out the time (and which clocks need to be repaired). Atomic clocks aren’t even that accurate (by the way, they are not nuclear – they use atoms not fission). Newer clocks are far more accurate. For centuries we have been improving timekeeping – trying to get a clock that was accurate as the biggest clock of them all – the Earth. The problem is now our clocks are more accurate than our planet. The Earth is actually slow requiring a leap second. Time keeping is so ingrained into our computers now that a leap second is a big deal. You won’t see any rocket launches near June 30 this year. There is a debate taking place if leap seconds are a good idea or not. Man invented time, don’t let something like planetary physics upset that. Personally, I think we should upgrade the earth to a more accurate model. Man created the month, day, hour, minute and second and now spends time trying to free ourselves from time’s tyranny. Time allows us to know when to tune into our favorite shows and TiVo allows us to watch it later. Time is actually one of mankind’s greatest accomplishments – we can’t agree on language, currency, or religion but we can agree on GMT – actually GMT in the US has been replaced with Coordinated Universal Time (it is the same thing, but less British). The problem is that our concept of time is a silly system that makes little sense. Changing time is not likely – it’s too intertwined and not broken enough. We are stuck with time zones, DST, leap seconds, leap years, and a funky system of months (28, 30, 31? ), and season changes taking place on the 21st. However, our agreement of time makes remote collaboration possible. Time is money as the adage goes, but time isn’t really money. As Dean points out, movies aren’t priced by the hour. and books don’t cost more if you’re a slow reader. How we make use of our time is what’s important – being efficient and productive is what matters. This is why telecom and communications is the place to be right now. Nothing else has the potential to change work and drive productivity as telecom does. iPad – right.. take away its network connections and you great a great game console.